The library recently added a new collection that I think is very exciting. Thanks to a donation from the Friends of the Library we now have audiobooks on Playaway. If you’re not sure what a Playaway is, let me fill you in. 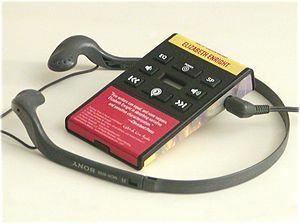 Each one contains an entire recorded book that you can listen to by attaching a set of earbuds or speakers. The device is about the same size as a MP3 player and comes with directions on how to operate so it is really easy to use. I love to listen to them when I walk, work in the yard and even when I clean the house. They are great because you never have to stop to change the CD. Also when you turn the device off it holds your place. The next time you turn the Playaway on it continues where you left off. If you are interested in trying this new format, just ask about them when you are at the library. There are titles available for kids, young adults and adults. If you like to listen to audiobooks in your car, also ask about how you can listen to Playaways through your car stereo.